I finished my Contemporary Drawn Thread class project this week. It's something I won't be doing again. It doesn't count toward my project challenge because it was a class during the challenge, but at least it's a Seminar piece done! I like the colors, but not the ornament. Maybe it'll grow on me. Looks like an art class project from middle school to me. No Honeydew this week! I used the two midnight blues - the metallic and the overdyed - to draw more spider legs all over my piece. I'm getting very close to halfway done with this part. It's going to be hard doing more work in this coming week, though, because I'm going on vacation for several days. Will bring stitching with me, but won't be dedicating time to stitching, if that makes sense. Every time I look at the center medallion, I smile. I really like the play of the copper and the blue. I finished this really dense band this week, with no more frogging. Go me! Now to do the flip of the little line of bird above it and on to the next one. I'm looking at my rotation list and going ... geez, I'm not going to finish any of these things soon. They're all too big. Dazzle will probably be the next finished. I have completed two things this week - they'll be in separate entries. More of the rooster's visible now. I should be finishing stitching it today and then sending it home later this week. This round robin, that includes my planets piece, is being cut short. The organizer is not going to be doing round robins anymore, so everything's going home. I have one more bit, another chicken, in my possession, and will stitch that before sending it home too. I hope someone's stitched something on my planets and I get them back. I don't know why, but I didn't get a picture of this last week. This week, though, you can significant progress on the flag. Even though it's very detailed, there are surprisingly large chunks of one color. That makes stitching go a lot faster. The due date for this one, Algerian Eye to Czar, is the middle of October. After working on it this week and already frogging quite a bit, I can confidently say it's not going in on time. This is one of those things that just got away from me this summer. 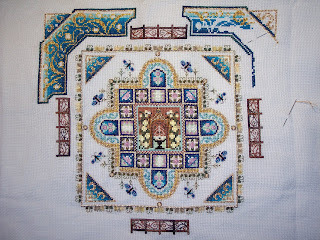 The piece itself is a group correspondence course through EGA which I am taking via Cyberstitchers. I've changed canvas size, colors, and type of thread, but what's hardest for me is counting in this one for some reason. I'll get it done, but I'm not going to stress about it like I was earlier this week. More honeydew, but I've come to see this color as wrapping up an area and saying time ot move on. I'm getting there on this, slowly, sure, but getting there. Maybe I can have this part done by Christmas. I started part three and it seems to be matching up with what I did of part two, so I'm a bit less uncertain now. I'll complete part three before finishing off part two. The colors seem to be blending well with the fabric still. I actually finished this thick band after the picture was taken. I feel a bit bogged down on this project and it's not really exciting me at the moment. I think it's just because I'm tired of that band. Maybe when I do the next, things will perk up. Yep, the latest round robin I'm working on is roosters! It's not too big to do one rooster, at least, and it's coming along fairly quickly. I'll have this one out the door by the middle of next week. It's on Aida, but at least the cloth is soft and easier to work with than some. Having it as one big piece helps, too. For some reason, I have a hard time working on small cuts of Aida. Guess which color I was working on this week? It's coming along pretty well, I think. Looks like I'll have the top half of this corner done soon and will be able to get the bottom half done. I still really enjoy working on this every time I do. I managed to get all the pots done on the first arch and start those on the second this week. All that's still needed in the first one is the gold curlicues. Making progress, for sure. I've made some progress on this. It's just wrapping, and to me that's not really stitching. All those white canvas threads need to get covered. Fewer showing this week than last. I should probably just sit down and do it one day and get it done. It looks like the next few things I'm doing on this piece are scotch and cashmere stitch rectangles. So far, I have most of the scotch stitches done on one side. When I work on it, it goes pretty quickly, and I like the colors. I finished all the Jessicas in this band this week. Looking at the next band ... that one's a huge amount of Jessicas. Before I get to it, though, there's another row of starfles (the middle band in the picture). I'll be starting them this week. Well, I finished this one early this week but waited until today to post it. Had to because my husband was away and I had to get a picture. At least this Aida was softer than the last few, and it was a quick and easy stitch. I'm still not sure I've counted right for the corners. There's really nothing to register them against and the backstitching is weirdly counted because of the single thread on the outline bit. Part three really doesn't help. It doesn't have any part of part two to register against on the chart. I may go ahead and do all of part three, then hope part four has tiny bits of both to place part two correctly. It's not like I'm keeping up with the chart, anyway. I still like the look of it on this fabric a lot and this is the first problem of this kind I've had with any of this designer's charts. I managed to stitch some on this at Seminar. It's going slow because it's not really in my rotation, but I'll get it done. I like it. This piece suffered, too, when I was at Seminar. I worked on it again last week, though, and you can see there are more blues on it now. It's gotten a bit more done since last week, and I hope to get to it once more before my husband takes pictures on Saturday. He's gone until late Friday night on a business trip, so I have more stitching time. I still like the look of this a lot. It's one piece I haven't gotten tired of working on - after a year and a half. This week I had to frog all the gold braid inside the arch. It was off by one stitch too low. Fixed that and added some green, including on the second arch. It's coming along, and I should have the first arch done in the beginning of October. This got put aside a bit when I went to Seminar, but I've made some progress. I worked on it last night, too, so it's farther along than this. The flag is definitely beginning to take form, and the stitching is relatively easy with large blocks of color. I'll be working on it more once I catch the round robins up - I need to finish it in time for Timothy to frame it by April. Anyway, it's a nice project that's not giving me any problems so far. Another one that's just -not- to my taste. At least it should go quickly and I will have it out by the end of the week. Maybe I can begin catching up on these round robins. Right now, I have two more in queue after this. None in the mail this week. Anyway, I've never even heard of this set of cartoon characters or whatever they are. The colors are certainly bright, though. Looking at this picture, I realize how very dense this particular band is. There's just so much that nearly everwhere is covered. No where for the eye to rest. Haven't gotten to work on it since I went to seminar; I'll probably be able to today. Perhaps I'll learn not to tackle so many big projects at the same time. This is my other class from the ANG Seminar - Flight of Passion from Meredith Willett. I'm one of those people who like to complete one thing before going off and doing something else. With seminar classes, that's impossible and resulted in Eric the halfabee. He's my first ever piece of turkeywork, though! I think I'm going to finish the flower before going back to him. I added the beads around the edge today, so I can call this -officially- finished. I think the beads look good for this. It counts toward my project challenge and now I am done, done, done with that designer. The picture on the bottom shows this seashell last Friday night. The one on top is last night. I'll be mailing it out today. It's another one on my sealife round robin, for Nicola in Australia. She wants to have all these motifs stitched on separate pieces of fabric and then make them into pillows for a charity. It was another piece on Aida, and my fingers paid for it! Since Aida is so stiff, I tend to use the stab stick method of stitching, which means I slow down and I end up sticking my fingers often. Even with a blunt tapestry needle, it hurts! This piece also counts toward my project challenge. Eventually, my teacher at Seminar promised me, this will be a three dimensional suncatcher. Honest. In the meantime, it looks like a post modern piece of something. I'm hoping to finish it this week, since it's not really stitching, but wrapping all these threads. Easy and mindless. Stay tuned. By the way, this was the Introduction to Contemporary Drawn Thread taught by Catherine Jordan. My husband went a little crazy with the Huswif pictures this week. I think he thinks it's done. I still need to add edging to it, though. All the sewings complete, and you can see here how it's put together. I'll be putting the beads I bought at Seminar on it probably tomorrow, after I finish the seashell for the round robin. Then it'll be done. I couldn't do as the instructions said for edging because there wasn't enough silk of any color left to make cording. So Why Did I Start Yet Another Project? For this one, I confess, it was my husband. The piece is called "Dazzle" and I got it through ghosting at the San Diego ANG 21st annual stitch in. It came in the mail. I asked him to make the stretcher bars. Two days later, he asked why I hadn't started it. It's started now. With luck, it'll be quick because it's only about six inches square, perhaps seven. I like its looks so far. I should have these Jessicas done this week! They're coming along pretty well, just have to count. None of my regular pieces, with the exception of the current round robin, got worked on while I was in Baltimore, so this one languished a bit. Hopefully, it won't for very long. I finished my version of Lorretta Spears' Florentine Fantasy last fall or winter. It took this long to frame it because my daughter, who picked the colors and is the recipient of it, had to paint the frame. I think she did a good job. My husband put this together before we left for the ANG seminar last Tuesday. I managed to do quite a bit of background work on the garden this week. More honeydew Watercolors. I'm beginning to look on this as a way of really measuring progress, since it's the main color that everything else lays on.